7.5 MWp project now scheduled for December 2014 completion. As I was reviewing my blog archive for The Apple of SunPower’s C7 post, I realized the project announced in “Tucson Electric Power Plans 6-Megawatt SunPower C7 Tracker System” never had a matching project completion press release. 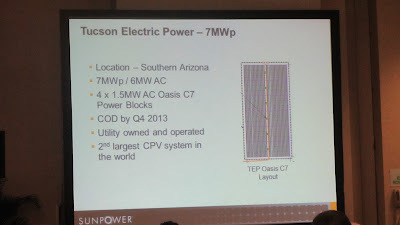 At the SunPower C7 Tracker Update at CPV USA 2012, SunPower Corporation (NASDAQ:SPWR) said the then 7 MegaWatt-peak (MWp) Low Concentration PhotoVoltaic (LCPV) project for Tucson Electric Power (TEP) would begin construction in the first half of 2013 and was scheduled for completion by 4Q 2013. TEP is still a subsidiary of UNS Energy Corporation though Fortis Inc. (TSE:FTS) completed the acquisition of UNS Energy last month. This project has changed locations and as a result we had to recomplete the permitting process, which delayed the project schedule. We anticipate that we will break ground soon. The SunPower system is on track for completion in December 2014. The project is being built near TEP’s Springerville Generating Station in Springerville, Arizona, adjacent to a 6.4 MW fixed PV array already operating on that site. The LCPV portion represents about 7.5 MW(dc). The remaining 2.5 MW(dc) will be built from SunPower T-5 modules, ground mounted. I’m unclear on SunPower T5 Solar Roof Tile modules being ground mounted, so I’ll guess these are SunPower modules mounted on single axis T0 trackers? Earlier the year, TEP presented “Utility Scale Renewables and Distributed Generation” at the 2014 UNS IRP Workshop, and the 10 MW SunPower Fixed/LCPV project was slated for an Oct 1, 2014, Expected In-Service Date. So what caused a three (3) month project delay since April: permitting issues or C7 modular receiver availability or both?